In this new weekly feature, CNN.com highlights five recommended Twitter feeds about a hot topic in the news. 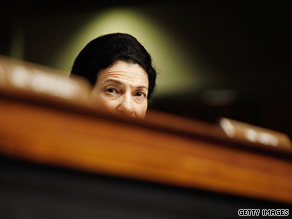 Despite her importance in the health care debate, Sen. Olympia Snowe of Maine is not on Twitter. (CNN) -- The U.S. Senate Finance Committee this week passed a 10-year, $829 billion health care reform bill -- partly because of a "yes" vote from a lone Republican, Sen. Olympia Snowe of Maine. Snowe doesn't appear to be on Twitter. Too bad. But plenty of other people are posting about health care reform and the U.S. health care system on the micro-blogging site. This list of health care twitterers is by no means comprehensive, so feel free to tell us about your favorites in the comments section below. 1. PolitiFact: The health care reform debate has been nothing if not confusing. "Death panels," "tea parties," Rep. Joe Wilson shouting "You lie!" at the president. It's a mess to sort through, especially on a vat of commentary and opinion like Twitter. Luckily, there are feeds like @PolitiFact to help. This Pulitzer-Prize-winning news group, which is part of the St. Petersburg Times, sorts fact from fiction on the health care debate and other topics. That "You lie!" comment, for instance? A lie, Politifact says. 2. SusannahFox: Fox is a researcher at the Pew Internet and American Life Project. Doesn't sound very health-care-relevant, huh? But Fox's Twitter feed is packed with anecdotes and statistics about how social media platforms like Twitter and Facebook are changing doctor-patient relationships and the state of health care at large. 3. kevinmd: Blogger and doctor Kevin Pho offers up commentary on his life as a physician and the health care system. His random tidbits of medical information can be a riot, especially if you're looking in from outside the medical community. 4. whitehouse: Buildings can type? Apparently. The official White House Twitter feed covers a slate of topics, but heath care has been especially big on the administration's recent tweeting agenda. 5. AmerMedicalAssn: This doctors' group tries to spice up the health care debate with its purple font! Oh, and tons of newsy updates on the latest votes, disputes and developments.